A garden, even a small one, needs tending when it needs tending. It’s harvest time for my little garden and I’ve been the grateful recipient of a bounty of fruits and vegetables from the gardens of friends and coworkers. My four Brandewine tomato plants have produced enough to share a few with my closest friends. I maintain that there’s nothing much better than a vine-ripened heirloom tomato fresh from the garden. They are best eaten with a shake of good sea salt and with juice dripping off an elbow. I’ve always thought that Sweet 100s were the best cherry tomatoes. I planted 4 of those, too. Last week I was gifted with a box of mixed cherry tomatoes, including some little dark purple ones the color of a 3 day old bruise. My friend Lisa thinks they are a Chocolate Cherry variety, and I intend to plant some of those next summer, too! I’ve received gifts of green beans, pears, plums, and lots of zucchini! The only down side is that it all has to be eaten now or processed for later. It’s interfering with my writing time, but harvest time is short and winter here can be long. I’ve had my dehydrator working overtime. I have dried multiple trays of zucchini chips, a few plums, and sage, peppermint, rosemary, and catnip from my herb garden. I’ll appreciate all these things I’ve harvested in the winter months. There’s more than one kind of garden. I am thankful for my flower garden, too. In my mind I see a lush and wide English style flower garden that blooms with vibrant color from the earliest spring bulbs to the last rose of summer. Let’s just say that I have LOTS of work to do. A garden is always a work in progress, and I have plenty of time to plan and plant and enjoy that harvest, too. Tonight I received an early Christmas gift of 3 pink and 3 red peonies. I planted them right away and watered them in well. I’ll need to keep watering until our long summer drought is over, but the rain should come soon. The dozen or so lilac starts that I planted this spring are mostly doing well. 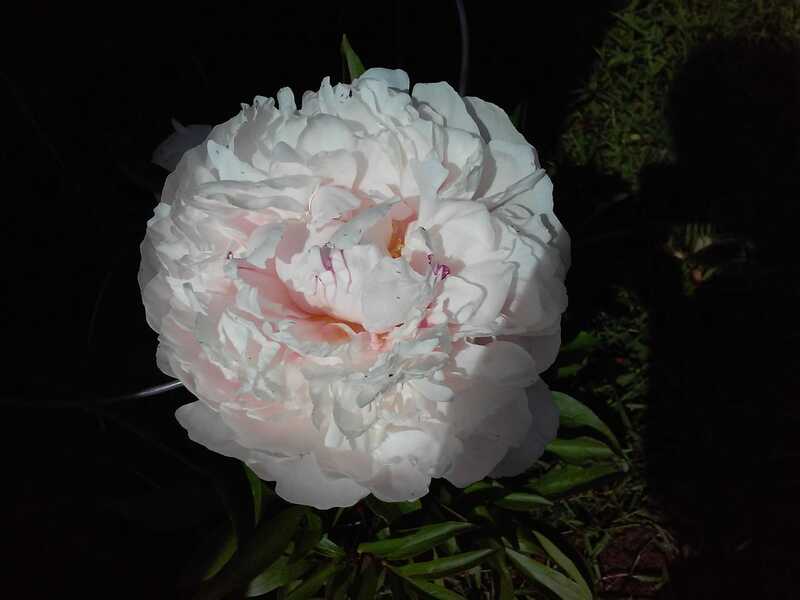 One of the 4 pale pink peonies that I got in the ground last spring bloomed for me this year. I have high hopes for the coming spring! I guess it’s the farmer’s daughter in me that makes me dig in the dirt to plant things in hopes of a harvest. It can be a harvest of food, flower, herb, scent, or beauty – or any combination. It’s all good.